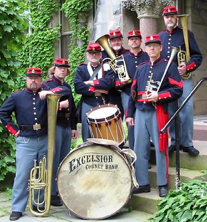 The Excelsior Cornet Band is New York State’s only authentic Civil War brass band. Founded in 2001, the band consists of a group of upstate New York musicians who are dedicated to the performance of original Civil War music on actual antique brass band instruments of the 1860’s period. Recreating the glorious sounds and appearance of this pivotal period in American history, the band performs the most popular melodies of the 1850-1870 period, as well as patriotic airs, operatic medleys, marches, and dance music by the era’s most renowned composers and bandmasters. All of the band’s musical arrangements come from the bandbooks of Civil War era bands, or are arranged from the original Civil War era sheet music. The musicians of the Excelsior Cornet Band are professional performers with many years of experience in a wide variety of musical genres. They perform with an enthusiasm and polish that brings the music of the Civil War brass band era to life. Their uniforms authentically and accurately represent those of a typical early-war New York State Militia band. 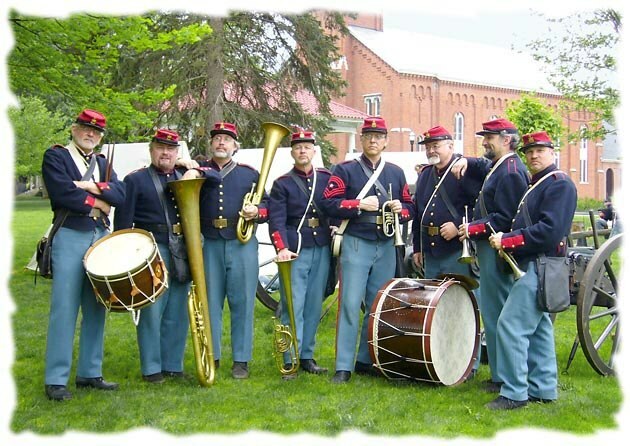 No other musical group in New York State can recreate the glorious sounds and appearance of the Civil War brass band era with such accuracy and authenticity. The Excelsior Cornet Band is proud to present the music of this important period of American history. in PDF format, from the LINKS page. We are always seeking period instruments for our performing collection. Of particular interest are any Over-The-Shoulder (OTS) instruments (especially E-flat soprano, B-flat soprano and B-flat tenor), any keyed brasses (especially E-flat bugle and E-flat alto ophicleide or quinticlave), and early “post horns” (small-bore trumpets with Vienna twin-piston valves.) Please Contact Us if you have an instrument that you think may be of interest to us! All contents Copyright © 2001-2017 Jeff Stockham. All Rights Reserved.